"We have felt very comfortable leaving our children in the care of Sunshine Learning Center. The teachers in the infant room are kind, caring and treat each baby as an individual. We appreciate the daily communications sheet so that we can tell how the day went. The teachers are very open and approachable." "My daughter began attending Sunshine Learning Center when she was 2 years old. The teachers teach children age-appropriate skills in a way that is fun for the kids—they don’t even realize they’re learning! I have always felt that Sunshine captures just the right balance between structure and free play, neither overly structured with pre-school children regimented into a strict schedule, nor complete chaos with children playing wherever and with whatever they choose. In the toddler rooms, my daughter played with toys inside and outside, did little crafts, and listened to stories, but she already knew her colors and was learning the alphabet, the days of the week, and counting skills when she moved from the toddler rooms to pre-school. There, she continued learning letter sounds with the “letter of the week.” She also learned behaviors and norms appropriate for school such as lining up to go outside, girls’ and boys’ bathrooms, sharing and taking turns, and cleaning up when finished with an activity." 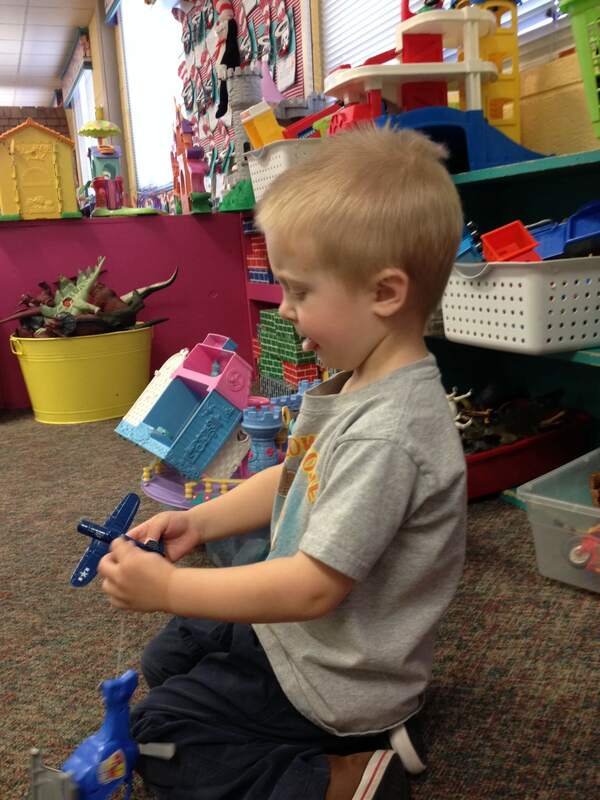 "My older son enjoyed his preschool class. The play area encourages creativity. The teachers show patience and understanding. We like that he did educational activities throughout the day and that he brought his completed work home to show his improvement." "I particularly like the way Sunshine moves the children up to the next class. As they approach the age and skill levels needed for the next level, they visit the class they will move to for a morning or afternoon. Then they return to their own class. After a week or two of these visits, they move permanently to the next class. By this time, however, they already know the children and teachers in the new class and so the transition is very easy. In pre-K my daughter has continued developing the social and cognitive skills she will need to be successful in kindergarten. I am confident that she will make this transition easily. Although I now recognize the significance of the “learning” part of Sunshine Learning Center, what has been most important to me is the care and love my daughter has received from her many teachers. The teachers at the school truly enjoy the children and learn their individual talents, fears, challenges, and joys. Discipline is fair and appropriate (though my daughter may not always think so! ), and designed to help children learn how to get along with each other. I feel like my daughter’s teachers have been my partners in raising my daughter to be a confident, well-rounded school citizen and, thanks to Sunshine, I know she will make the transition from pre-K to kindergarten and on into elementary school easily." "My daughter has attended Sunshine Learning Center since she was a year old, progressing through all the classrooms to the Explorer’s Club after-school care and summer day camp now that she is in elementary school. For her, going to Sunshine in the afternoon is like going home after school! The Explorer’s Club provides time and help (as needed) for doing homework, as well as snack and play time. I am so grateful that we don’t have to face homework at the end of the day when my daughter and I are both tired. She appreciates the time after homework to relax and play games with friends and I appreciate that fact that she’s not relaxing in front of the TV! Summer Explorer’s Club is great! My daughter is busy all day playing at parks, swimming, and taking interesting field trips to zoos, nature preserves, the county fair, and even the Denver Mint one year. The kids also go to the library every other week and have read books together as a group, so I also appreciate the fact that education continues, but in a fun way for kids. My daughter has attended several other after-school and summer programs, but Sunshine is definitely her favorite. Parents who are looking for summer programs for their school-age children should give Explorer’s Club serious consideration." Your child will discover new friends, skills, and more when they are a part Sunshine Learning Center' Call us today to learn more about one of the best Colorado Springs daycare centers!